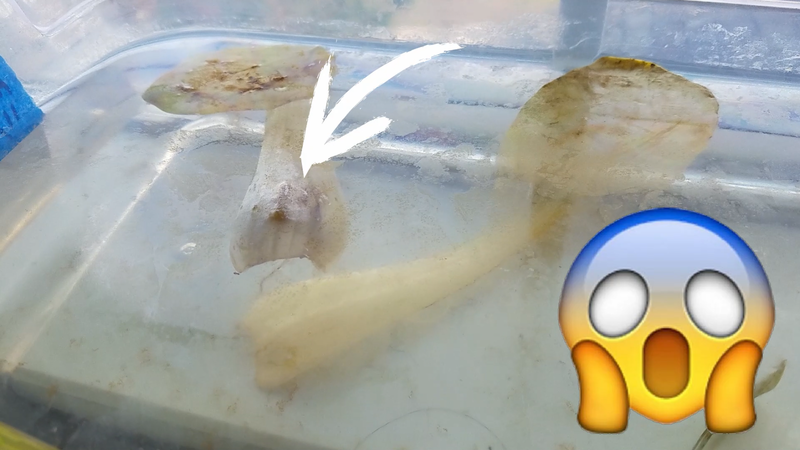 Congratulations, you have new baby fish! But no, you didn’t choose to breed some easy livebearer. No, you went for the challenge of egg layers like tetras, gouramis, or rainbowfish that produce the world’s most ridiculously tiny fry possible. Ack, what do you feed them? After researching how fish farms create infusoria to raise fish fry, here’s the easy, bulletproof way I use for making infusoria at home. After all the fun I had raising my cory catfish, I totally had baby fever and I’m was like, “Sweet! What else can I breed around here?” I decided to find my little honey gourami a wifey because I heard they’re also really easy to breed. Unfortunately, honey gourami fry are super tiny. Unlike guppies and other livebearers, they come out way too small to eat baby brine shrimp, crushed up flake food, and other typical fry foods. So I knew I needed to make infusoria. 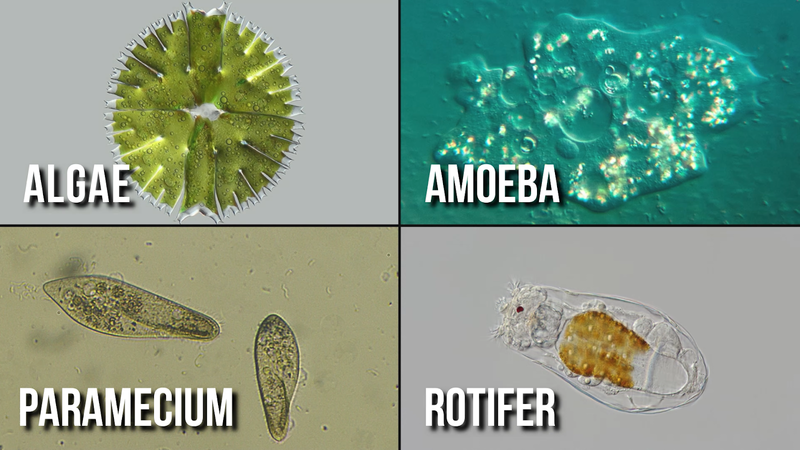 Basically, infusoria is an old term referring to single-celled microorganisms like algae, amoebas, paramecium, rotifers, and other protozoans. Everyone says it’s a piece of cake to make: simply add lettuce or cut grass or any kind of organic material to water, put it in windowsill with sunlight, and boom, you have infusoria four to seven days later. Based on those easy Internet recipes, I put some aquarium water (which should already have some microorganisms in it) in a small plastic tub and added some leaves of baby bok choy (because I’m Asian and that's how I roll). Unfortunately, because I put it in the water raw, the leaves stayed intact for several days and didn’t break down as quickly. After a few days, the water surface got really scummy and smelled totally gross. Plus, because we got several cloudy days in a row, the water didn't get enough sunlight and stayed pretty cold in this wintertime climate. One week later, the baby bok choy started to get some kind of white mold or fungus… was it even safe to use?? 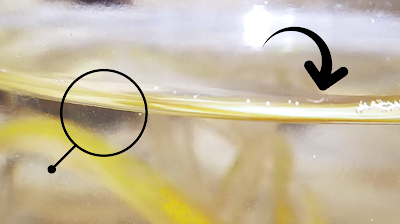 At this point the honey gourami eggs had already been laid. I’m doomed! The newly hatched fry were going to starve to death if I didn't have enough infusoria! How could I speed things up? Start with a clear jar (or larger container if you have more fry) and fill 2/3 to 3/4 of it with dechlorinated tap water or aquarium water. The aquarium water will contain microorganisms to kick start your culture, but make sure it doesn't contain any daphnia or cyclops or else they'll eat up all your infusoria. Add organic matter to feed the infusoria. Cut up some lettuce leaves and then blanch/boil them for a minute or two before adding them to the jar. You can also use spinach leaves, decomposing aquarium plant leaves that you've pruned off, cut up grass or hay, fry food, a crushed up algae wafer, yeast, or any number of nutrient sources. Keep the water warm in the 70's degF by putting the jar in a windowsill with sunlight or shining a warm desk lamp on it. To minimize surface scum and horrible rotting smells, aerate the liquid by stirring it 2 to 3 times a day or adding a little air from an air pump. The culture may first turn cloudy as the bacteria colony first grows. Then the culture will become clear and odorless as the infusoria eats up the bacteria. 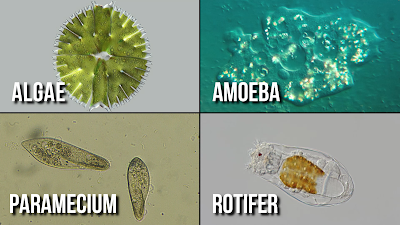 Depending on conditions, it may take about a week to create a dense infusoria culture, so depending on how quickly the eggs hatch, you may want to start the culture at the same time you introduce the fish parents for breeding. To collect the culture, turn off the air pump, wait a few minutes until all the organic matter has sunk to the bottom, and use a syringe or turkey baster to collect the infusoria just below the water surface. Try to avoid sucking up any rotting organic material so you won't foul the fry tank water. 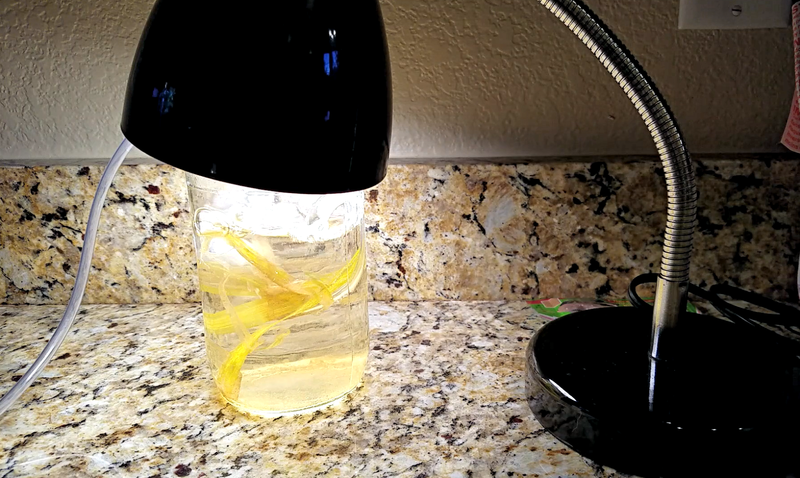 Squirt the liquid directly into the water column of your fry grow-out tank and watch them feed! If you need more infusoria, you can use the old culture to start additional batches of infusoria in new jars. My honey gourami fry were in a 10-gallon tank, and I fed them five times a day, alternating between Hikari First Bites and 5 ml syringe full of infusoria culture. Because I was heavily feeding them, I changed 15-20% of their water every day to maintain high water quality. Thankfully once the fry are two weeks old, most of them will be big enough to eat baby brine shrimp and other traditional fry foods. Have you made infusoria before, and if so, what worked for you? Comment below to share your experiences because I’d love to hear them. Also, if you're looking for a fun and easy fish to breed, check out my article on raising cory catfish fry. Don’t forget to take time to enjoy your aquariums and I’ll see you next time!